When I saw this recipe in the BBC Good Food Magazine, I knew it would be my kind of food. 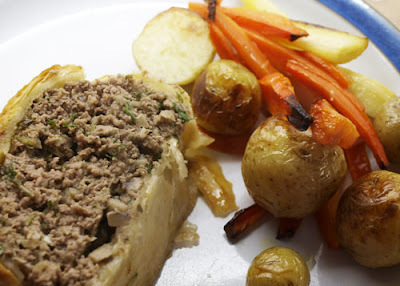 What a clever idea to use minced beef instead of filet steak as a Beef Wellington. The recipe came from John Torode (he of Masterchef, not the bald one) and was passed to him by his grandmother. The recipe makes one large Beef Wellington, but I ended up making two. I also managed to freeze one of them after cooking and reheated it wrapped in foil, with the last 10 minutes unwrapped and it was just as good as the one that came straight out of the oven. This is definitely a keeper! what a great idea, did it taste as good as the traditional version? It tasted pretty good, I guess it depends on how good the mince is. Brilliant idea. 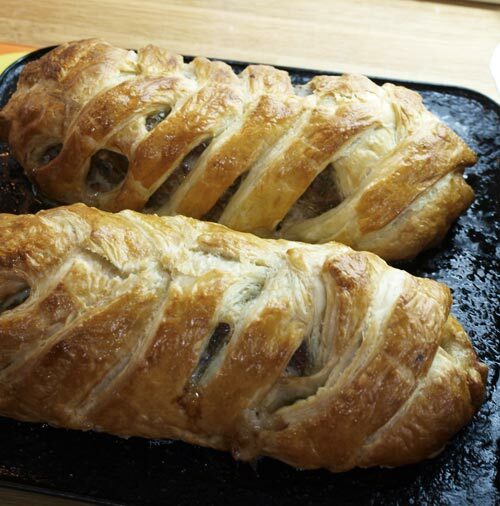 My mother in law makes a wonderful beef wellington but I know how much it costs her for that giant log of fillet! Making it with mince is such a good idea for homely meals on a budget. Looks very tasty, any good cold ? for some reason Janice, I just happened to see your favourite books bit on your profile. I love the Crystal Cave & of course P&P, but have never read Bernard Cornwall. Now thinking if you like him, he must be OK??? I have read all the Bernard Cornwell Sharpe novels and, although the very late ones were not so good, there are about 10 really cracking adventure/thriller type novels with well written characters and plenty of action. Start with Sharpes Rifles. I've also read the sailing books he wrote which are quite good. I didn't enjoy his Arthurian series or the ones about the American Civil War. Enjoy! What a fantastic idea... and so much easier. I really love the sound of this. Well. What a revelation. I had venison wellington last night at a restaurant and it was delicious. I've always wanted to make it myself but have been too tight to buy a fillet of beef. Now I know I can use mince instead! You've made my day! What a brilliant idea, Janice! Must give this a try. Looks excellent. Hotel Chocolat Giveaway - Winner! A moment on the lips...not so much on the hips!